What will you find at the Geneseo Community Center? The Geneseo Community Center has been in operation since January 16th of 1983. The Center offers something for everyone with an indoor pool, cardio/weight room, life fitness room, and gymnasium with basketball, pickleball & racquetball courts and an indoor elevated walking track. Fitness on Demand is available during open times in the life fitness room and is included in your membership! Looking for instructor led fitness classes? We have those too. Learn More. The Community Center is located at 541 E. North St., Geneseo, IL. Learn how you can become a Geneseo Community Center Member today! ALL DATES AND HOURS ARE SUBJECT TO CHANGE. GIVE YOUR FRIENDS OR FAMILY THE GIFT OF FUN. Geneseo Park District gift certificates make the perfect gift any time of the year. Gift certificates are available for any value and may be used for all Park District facility rentals, and recreational programs. Gift certificates may be purchased year round at the Geneseo Community Center. Call (309) 944-5695 for more information. You can purchase Central Theater movie tickets for your friends or family through the Geneseo Park District. Movie tickets may be purchased year round at the Geneseo Community Center or at Central Theater. Added in January 1996 the temperature controlled indoor pool consists of 4 lanes extending 25 yards long. The center’s indoor pool is open year round and hosts a wide variety of aquatics programs, such as youth swim lessons, aqua fit and power splash just to name a few. More Information for a full list of aquatics programs. Members can also take advantage of family open swim times or specific daily times dedicated to members only lap swim. 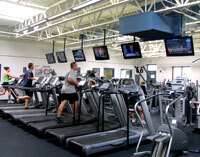 The center’s cardio/weight room contains cardio equipment, machine & free weights. As a new member, you receive a fitness assessment to attain an overview of your current fitness level. The Gym and Walking Track are open daily during normal Center Hours*. *The Park District reserves the right to close the Gymnasium for any activity or program without notice. The Center's Gymnasium features two full size basketball courts and two racquetball courts (located on the north end). These courts are mainly used for free play time like shooting hoops, playing volleyball, racquetball, pickleball or pick-up basketball games. Surrounding The Center’s basketball courts is an Indoor Elevated Walking Track. The carpeted 6 foot wide track allows members to walk or run all year round while observing the gym and racquetball activities. The Geneseo Park District Babysitting Service is available for children of our patrons. Parents or guardians must remain in the community center building while the child is in the babysitting room. Children must be at least 6 months of age and care items must be provided by the parent, such as diapers, bottles, etc. Items must be labeled with child’s name. Bottles and sippy cups of juice are permissible. Food items are not to be brought into the room, crackers are provided. Walk-In Members: $3.00 per child per visit. 3rd and 4th child are $1.50 per child per visit. Maximum of $9.00 per visit. Walk-In Non-Members: $6.00 per child per visit. 3rd and 4th child are $3.00 per child per visit. Maximum of $18.00 per visit. *Punch cards can be purchased at the Geneseo Community Center. Child must be a member. Punch cards expire 1 year from date of purchase. Punch cards are not transferable. Any refund requests will be handled on a case by case basis. Each child in the babysitting room must have an informational sheet on file. Each child must check in at either the front desk or pool desk for pass validation. Punch card holders may proceed to the babysitting room. Patrons paying the walk-in fee must do so at either desk. Parents/Guardians must sign in and sign out each child. Under no circumstances will a child be allowed to leave the room without a parent/guardian sign them in or out. Parents/Guardians must remain in the Community Center while their child is in the babysitting room. During the Summer session, parent/guardians may be at the Outdoor Pool while their child is in the babysitting room during normal Babysitting Service Hours. Care items (i.e. diapers, bottles, sippy cups) must be provided by the parent/guardian. Items must be labeled with the child’s name. Children are welcome to bring their own toys and will be expected to share. The Geneseo Park District is not responsible for any toy broken. Food items are not allowed into the babysitting room. Only crackers and water are provided. Children must be at least 6 months of age and no older than 10 years to be allowed into the babysitting room. The Geneseo Park District has a staff to child ratio guideline of 10:1. Every effort is made to maintain this ratio. As usage fluctuates in this multi-age environment, we reserve the right to adjust that ratio up or down with safety of our patrons as the top priority. In some cases, a child may not be allowed into the babysitting room until the ratio guideline is met. No children will be allowed in either the cardio-weight room/Weight Room or Fitness Classes. School-Aged children can be in the gymnasium or lobby areas unsupervised so long as their parent/guardian remains in the Community Center and they follow the rules of usage. Children not of school age must be under direct supervision of a parent/guardian or a caregiver at least 11 years old. Dedrick room, main gym with basketball & pickleball courts, program gym with gymnastics equipment, indoor pool & lounge and the life fitness room. Host a business meeting in the Dedrick room, have your own basketball tournaments or throw that special someone a baby shower. The Center has the space for your next event! Contact (309) 944-5695 to reserve your space today. The Geneseo Park District facilities are available to rent for your next event. Certificate of insurance may be required. Visit https://www.theeventhelper.com/ to purchase event insurance.